One of the best things about staying in a hotel is the blackout curtains. After a long day of travel, nothing beats quality sleep in a cool, dark room. 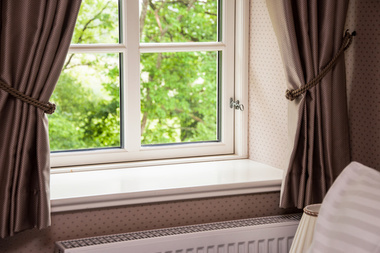 But dark, opaque window treatments aren’t always the best choice for everyday living. Scientific studies show that humans still follow the productivity patterns of their ancestors, meaning we are productive and active during daylight hours and we rest when it’s dark out. Here’s a list of four light window treatments to keep your space airy and bright for optimal productivity. These pieces can be absolutely stunning – with a corresponding price tag for the really high-end items. Fortunately, you can find less expensive options with much the same effect as the high-end ones. Etched glass allows in light, is visually appealing and retains privacy for all of the room’s inhabitants. Layer shades are an attractive option because they are the best of both worlds. With layer shades, you achieve some level of light reduction, but not total darkness. Manufacturers “layer” opaque panels with sheer ones for a compromise between the two extremes of illumination. Solar shades that you often see in restaurants are available for residential use as well. One thing that’s great about solar shades is that most models have the spool option. When you want to use them, pull down the shade. When the outside lighting is to your liking, roll them up into their case at the top of the window. Another benefit is that solar shades will protect your flooring or anything else that might otherwise fade in direct sunlight. Choices in traditional window treatments are evolving from damasks and florals to burlap and gauze. On the opposite side of the treatment spectrum, not all fabric window decorations are lace or basic sheer. For example, metallics are making a comeback in fashion options and this represents an opportunity to add some sheen and visual appeal without the weight. Gold, silver, bronze, oh my! Bring on the sparkle, because we can all use a little more of that in our lives. Sheer panels with patterns are a fun option for keeping your interior airy and bright. Patchworks, polka dots, or horizontal or vertical stripes will all allow in light without sacrificing style or privacy. Window treatments are a great way to personalize any space, and their lack of permanence allows for periodic change, which we all love in home decor.